This is the most recent version of this document. IEC 60601-2-16:2012 applies to the basic safety and essential performance of haemodialysis, haemodiafiltration and haemofiltration equipment. IEC 60601-2-16:2012 does not take into consideration the dialysis fluid control system of Haemodialysis equipment using regeneration of dialysis fluid and central delivery systems. It does however take into consideration the specific safety requirements of such haemodialysis equipment concerning electrical safety and patient safety. 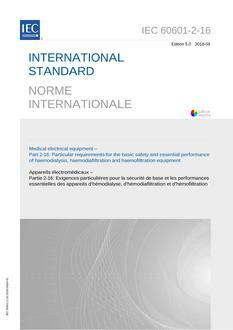 IEC 60601-2-16:2012 specifies the minimum safety requirements for haemodialysis equipment. These devices are intended for use either by medical staff or for use by the patient or other trained personnel under the supervision of medical expertise. IEC 60601-2-16:2012 includes all electromedical equipment that is intended to deliver a haemodialysis, haemodiafiltration and haemofiltration treatment to a patient suffering from kidney failure. This fourth edition cancels and replaces the third edition of IEC 60601-2-16, published in 2008. This edition constitutes a technical revision. Changes since the previous edition include, among others, better adaptation of IEC 60601-1-8 and improvement of subclause 201.8.3.